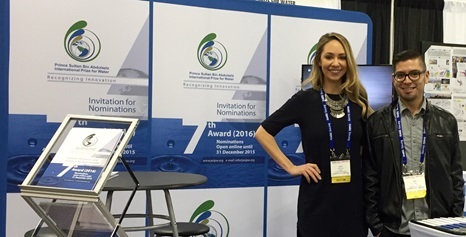 The Prince Sultan Bin Abdulaziz International Prize for Water is participating in the 48th Fall Meeting of the American Geophysical Union, which is being held in San Francisco California from 14 to 18 December 2015. The AGU Fall Meeting, with nearly 24,000 attendees, is the largest Earth and space science meeting in the world. It is one of the most important events for the world’s hydrologists, hydrogeologists, meteorologists, and GIS specialists working in water. For PSIPW, which awards cutting-edge scientific innovation, it is an ideal opportunity to meet the world’s’ leading water scientists along with many other scientists working in other fields. Some of the most important and groundbreaking water-related work these days is multi-disciplinary. This is why past PSIPW prizewinners have not only been water scientists, but also physicists, aerospace engineers, atmospheric scientists, materials scientists, and even economists working on water science applications. PSIPW’s General Secretary Dr. Abdulmalek A. Al Alsheikh, will be attending the meeting, where PSIPW also has a fully staffed booth. The PSIPW film will be presented and brochures will be distributed. Many other PSIPW alumni are in attendance. PSIPW also has a strong online presence in the AGU Fall Meeting’s digital communications. Nominations for the current 7th Award are still underway, but will be closing on 31 December 2015.